They are the centerpieces - many folks would say "gems" - of most towns that are county seats across the Hoosier state. 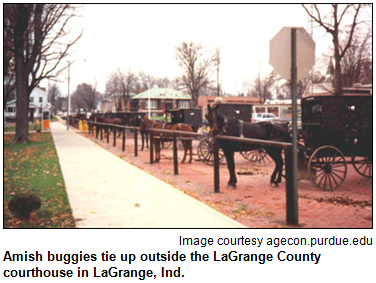 One courthouse square, located in the heart of Amish country, has parking for buggies as well as cars. In another county, a historic courthouse was restored after local women - many of them more than 75 years old - undressed and posed for a calendar as a fund-raiser. In yet another county seat, a downtown area has three nearby structures built as courthouses. Chris Flook, a telecommunications instructor at Ball State University who devoted summers to visiting and photographing courthouse squares, or their equivalents, in all of our state's 92 counties. His project, a collaboration of several departments at Ball State, has a website at www.indianacourthousesquare.org with county-by-county visuals. And Indianapolis-based architect Jim Kienle, who specializes in historic renovation. Jim, director of historic preservation for Moody Nolan, has been a popular guest on several Hoosier History Live! shows, including a program in 2009 about the Orange County Courthouse in Paoli. 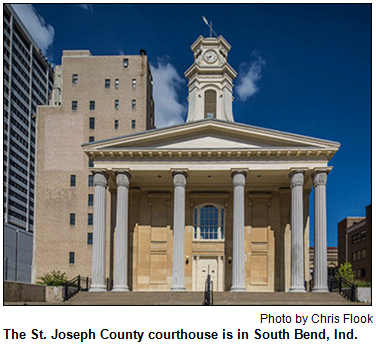 Jim restored that historic courthouse, which was built in the Greek Revival style in 1850. During our show, we won't just focus on counties with historic courthouses. Nelson and his guests also will explore cities that demolished their county courthouses. 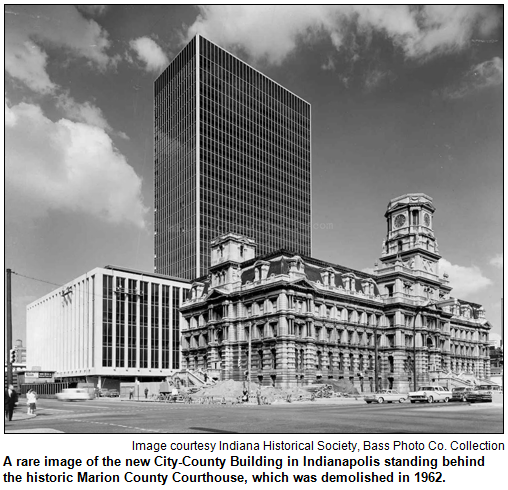 They include Indianapolis, where the ornate Marion County Courthouse was torn down during the early 1960s; courtrooms are housed in the City-County Building, a 28-story office complex. In Delaware County, the historic courthouse in Muncie also was demolished during the 1960s. Ohio County. The courthouse in Rising Sun, which was built in 1844, is the oldest still in use. 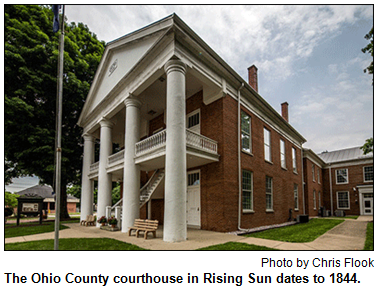 Like the Orange County Courthouse, the second-oldest, it was built in Greek Revival style. Randolph County. The historic courthouse in Winchester became the focus of national attention when members of a women's bridge club disrobed to pose as "Calendar Girls." The women, including one nearly 94 years old, raised money to spare their beloved courthouse from demolition. The book Magnificent 92 (IU Press, 1991) quotes a 19th-century historian as rhapsodizing: "A man might sooner be the architect of that edifice than be President of the United States or King of England." Elkhart County. Nearby parking areas in Goshen include spaces for cars as well as hitches for horses because of the Amish communities that have flourished in the county since the 19th century. Allen County. Often identified as the most lavish in the state, the county courthouse in Fort Wayne was completed in 1902. According to Magnificent 92, its architectural design was influenced by the Chicago World's Fair of 1893. Stained-glass windows, sculptures and paintings adorn the courthouse. Hancock County. Also known as ornate, the courthouse in Greenfield has architectural features known as "grotesques," which are similar to gargoyles. St. Joseph County. In downtown South Bend, three nearby structures were built as courthouses. Wabash County. Located atop a hill, the majestic courthouse in Wabash was the setting for a claim to fame for the town in 1880. The courthouse was the site of an early experiment in electricity that drew international attention. Thousands of visitors watched as electricity jumped from one lamp to another in the dome of the courthouse, which, like many historic courthouses, has a clock tower. And Madison County. During the early 1970s, the 19th-century courthouse in Anderson was replaced by a structure of glass, steel and brick on a public plaza. 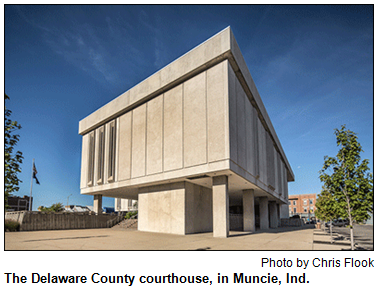 To photograph the 92 courthouse squares or their equivalents for the Indiana's Courthouse Squares project, our guest Chris Flook avoided interstates as he drove from county to county. A native Hoosier, Chris has worked on several documentaries and projects focused on Indiana history. They include a new documentary about the Lenape (the Native American tribe that white settlers called Delaware Indians) that had its premiere in Muncie last month. In fact, Chris will appear on our show following a series of showings of the documentary in Oklahoma, the home state for many descendants of the Lenape who once lived in Indiana. 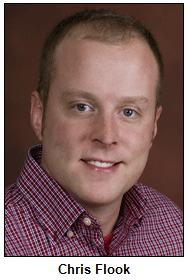 Chris also serves on the boards of the Delaware County Historical Society and the Indiana Barn Foundation. 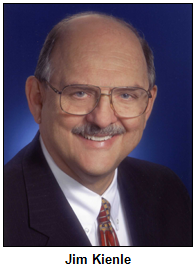 In addition to restoring the Orange County Courthouse, our guest Jim Kienle has been involved in the restoration of historic movie theaters across Indiana. They include the initial renovation of the Circle Theatre in Indy during the early 1980s and, more recently, the award-winning renovation of the Lerner Theatre in Elkhart. Guest Roadtripper Terri Gorney of Fort Wayne, who also volunteers at a number of conservation organizations, including ACRES, DNR and Limberlost, suggests we take a wander through nature at the beautiful Tel-Hy Nature Preserve in Huntington. In Hebrew, Tel means "high" and Hy means "life," which describes the high bluffs with great views of the Wabash River in the preserve. Tel-Hy Nature Preserve is just under 40 acres in Huntington County and was donated to ACRES Land Trust by Hy and Lorry Goldenberg in 1994. Tel-Hy has the distinction of being featured in the book Weird Indiana due in to part to its collection of outdoor privies located on the preserve just off the parking lot. According to legend, Hy Goldenberg once ordered a single outhouse but was shipped two by mistake. 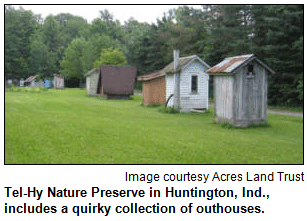 Apparently he believed two of anything was a collection, so he started collecting more unusual outhouses. The preserve has a variety of wildflowers, including Virginia bluebells, wood phlox, hepatica, snow trillium, goldenrods and asters. Sycamores, black walnuts and beech are just some of the soaring trees on the property. And a number of birds call this property home at least part of the year; they include scarlet tanager, wood ducks and wood thrush. During the "Super Tornado" outbreak of April 1974, a courthouse in an Indiana county took a direct hit from a powerful twister. The tornado demolished so much of the historic courthouse, which had been built in 1894, that county leaders decided they had no choice but to remove the remains and build a new courthouse from the ground up. The impact of the tornado on the county courthouse was discussed on Hoosier History Live! during a show last month on the 40th anniversary of the April 1974 tornado outbreak. Question: What Indiana county OR town (county seat) lost its historic courthouse to a tornado in 1974? Either the name of the county or the town may be supplied to win the prize. Hint: The county courthouse was located in the northern half of Indiana. The prize is a two passes for Indianapolis 500 Track Tours and a gift certificate to Latitude in Castleton, courtesy of Visit Indy, and four passes to the Indiana Experience, courtesy of the Indiana Historical Society. Has it really been 22 years since she became the first woman to win the Rookie of the Year award in the Indianapolis 500? 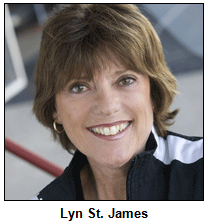 Even though time has roared by and Lyn St. James retired from Indy Car racing in 2001, the pioneer has never left the spotlight. In fact, Lyn, who competed in the 500 Mile Race seven times, will be racing again at the Indianapolis Motor Speedway on June 8. Along with such fellow veterans as Al Unser Jr. and Willy T. Ribbs, she will compete in the Indy Legends Pro-Am, a race on the Speedway's road track with muscle cars, including vintage Corvettes and Mustangs. Before that, Lyn, 67, will be Nelson's studio guest, as Hoosier History Live! explores the life and career of the race-driver-turned-motivational speaker who has been a role model for young women and girls. "There's no sound in the world like the scream of an Indy car" is the opening line in her book Lyn St James: An Incredible Journey (LSJ Press, 2005), which initially was published as Ride of Your Life (Hyperion, 2002). In the book, she writes about her unforgettable first visit to the Speedway as a teenager. While her male friends could walk around Gasoline Alley, Lyn was forced to wait outside because women and girls weren't allowed in the restricted area then. 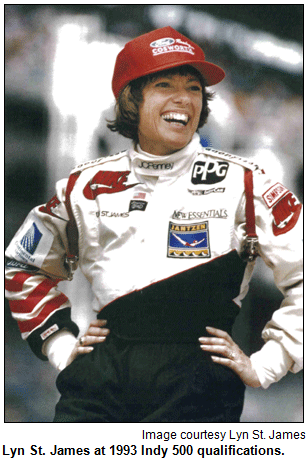 Although she became the first woman to be named Rookie of the Year - that happened in 1992, when she finished 11th, her best result - Lyn wasn't the first woman driver to compete in the Indy 500. That distinction, of course, belongs to Janet Guthrie, who competed in the 1977 race. But Lyn's accomplishments in a sport that remained almost universally male-dominated resulted in visits to the White House to meet three presidents (Ronald Reagan, George H.W. Bush and Bill Clinton) and appearances on national TV programs, including The David Letterman Show and The Today Show. She often has been included in lists of the "Top 100 Women Athletes of the 20th Century." Primarily based in Phoenix now, Lyn has lived in Florida, Ohio and, periodically, the Indianapolis area. She has worked as a pit reporter for ABC and ESPN. Her civic endeavors include serving on the advisory board of the Indiana Fever pro basketball team and as a founding board member of the Indiana Motorsports Association.